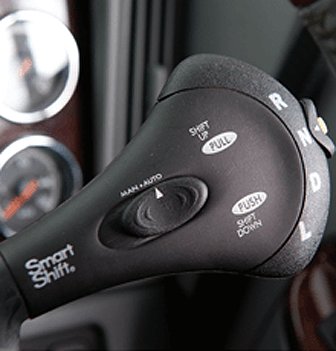 Designed to offer more freedom in the cab, Freightliner SmartShift™ is a huge shift forward in automated mechanical transmission technology. Mounted to the steering column, hands-on-the-wheel shifting offers drivers more room in the cab and minimises the fatigue that can build up over the course of the day when using a traditional gear-shift transmission. Easy to operate with the push or pull of a hand lever. More space in the cab because the floor-mounted or seat-mounted shift control is eliminated. No need to remove hands from wheel to operate. Driver's eyes remain on the road which means less physical and mental driver fatigue. Automatic shifting feature is easily overridden.